A collection of ALA's literature award winners and various notable reading lists. The Association for Library Service to Children promotes reading and books through recommendations, compilations of lists, and related services. The Batchelder Award is given to an American publisher for a children's book considered to be the most outstanding of those books originally published in a foreign language in a foreign country, and subsequently translated into English and published in the United States. Established in 1996, this award is presented to a Latino/Latina writer and illustrator whose work best portrays, affirms, and celebrates the Latino cultural experience in an outstanding work of literature for children and youth. A blog published by Booklist Publications, a part of the American Library Association, that reviews books and provides suggestions of programs for children and tweens. This award is given by the Association for Library Service to Children, a division of the American Library Association, to the artist of the most distinguished American picturebook for children. A complete list of the Author, Illustrator, John Steptoe, and Virgina Hamilton winners (and honor books where appropriate). Given to African American authors and illustrator for outstanding inspirational and educational contributions, the Coretta Scott King Book Award titles promote understanding and appreciation of the culture of all peoples and their contribution to the realization of the American dream. The list of all winner and honor books from 2006 to present. The Geisel Award is given annually to the author(s) and illustrator(s) of the most distinguished American book for beginning readers published in English in the United States. Complete list of winner and honor books from 1922 to present. This award is given annually by the Association for Library Service to Children, a division of the American Library Association, to the author of the most distinguished contribution to American literature for children. Each year a committee of the Association for Library Service to Children (ALSC) identifies the best of the best in children's books. 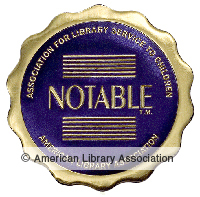 According to the Notables Criteria, "notable" is defined as: Worthy of note or notice, important, distinguished, outstanding. As applied to children's books, notable should be thought to include books of especially commendable quality, books that exhibit venturesome creativity, and books of fiction, information, poetry and pictures for all age levels (birth through age 14) that reflect and encourage children's interests in exemplary ways. The complete list of winner and honor books from 2001 to present. The Robert F. Sibert Informational Book Award is awarded annually to the author(s) and illustrator(s) of the most distinguished informational book published in English during the preceding year. Information books are defined as those written and illustrated to present, organize, and interpret documentable, factual material for children. The purpose of this database is to create a tailored reading list of quality children's literature or to find out if a book has won one of the indexed awards. The Child Witness to Violence Project (CWVP) is a counseling, advocacy, and outreach project that focuses on young children who are the hidden victims of domestic and community violence, and other trauma-related events. A collection of resources from the Indianapolis Public Library. Roberts, Sherron Killingsworth; Crawford, Patricia A. YC Young Children; Washington Vol. 63, Iss. 5, (Sep 2008): 12-17. Books can be wonderful tools to use with children who have experienced difficult times such as trauma or loss. Reading (or being read to) and talking with adults can help them understand and cope with their feelings in a developmentally appropriate way. To meet the needs of children and youth, families, and educators during times of crisis, NASP has translated the following school safety and crisis resources into various languages.